Islamic architecture has changed a lot, but most of these changes appear to be more recent. In this task I will be researching, analysing, comparing and illustrating Islamic architecture and the ways in which it has changed. Where better to begin than with some medieval history? "Where better to begin than with some medieval history? The Alhambra, in Granada, is a fine example of medieval Islamic architecture. For example, it features key features of Islamic architecture such as a focus on courtyards, and a limitation on the number of outwards facing windows. Islamic architecture tends to be very private, providing an escape from outside and the often harsh environments of Islamic areas. Other traditions of Islamic architecture follow ideas such as hiding structural elements, a focus on colour and decoration, as well as geometry. The growth of a house in Islamic architecture happens as need for the growth occurs. For example, if a family grows, so will the house. There is not a specifically set plan or design. The Alhambra, shown in the image above, is made of stone which very traditional Islamic architecture. It is a big characteristic found in many Islamic buildings and is perhaps one of the most defining exterior features. The Alhambra stays true to the idea of having courtyards within the structure. It has multiple courtyards throughout which feature different elements, such as the two examples above showing a pond and a fountain. As can be seen, the courtyards are surrounded by windows and balconies, yet another example of the Alhambra's culmination of Islamic architectural of elements. This building is a very old one. One with a lot of history. It used to be a fort, hence it's irregular shapes and ramparts. It is now a popular tourist destination, but as far as medieval Islamic architecture is concerned, it really is a prime example. More recently, there have been big changes in Islamic architecture. With a move into contemporary design and a focus on modern day issues, the Masdar City has begun to emerge. Shown to the right is concept image of Masdar City. It is planned to be completed in 2025 and will be a pioneer at the forefront of eco-cities. The whole city is planned to be run off solar power, a move which at first may seem to contradict the fact that this area of the world is centre for crude oil. However it makes sense that with all the money generated from selling oil to other countries, Masdar City should be an investment in a solution to the growing fuel problems. The whole city is very modern in design, but there are still many features that are similar to older examples of Islamic architecture. 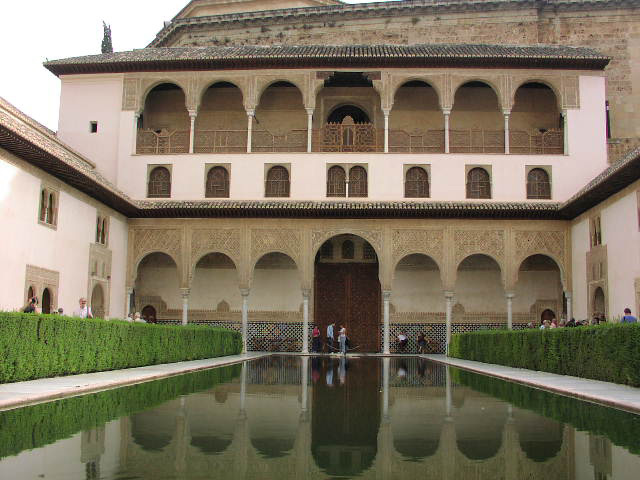 The picture to the right, for example, shows an example courtyard which is arguably similar to the pond example shown from The Alhambra above. It not only has the water in the center, but also has the overlooking widows too. To the right is a small gallery of examples from the website of Foster + Partners, who are working on the city. Click on each image to see them larger. traditional Islamic architecture is that Masdar City will be completely encompassed in a wall. This is to protect the city and it's population from the harsh environment which it is situated in, as with medieval Islamic architecture. There is more to this new city than connections to the past though. This really is a city for the future. The whole city is designed to run off solar power where possible. It will also make use of a huge hydrogen power plant too. There will be no cars within the walls, meaning that people will be encouraged to walk or cycle. No skyscraper will be allowed either, allowing maximum amounts of light to reach the solar panels. There are also mass plans for recycling and composting too, as well as providing clean water for the whole population. The cit aims to produce no carbon and no waste. At all. If it works then it will be a triumph for Abu Dhabi, but more importantly Masdar City will become an example of an entirely feasible future. It is entirely reasonable to suggest that Madar City has ben influenced by globalisation. This term is often associated with the spread of multinational companies, for example McDonalds who, in 2011, had reached operation in over 100 countries. But globalisation goes beyond the spread the spread of businesses, it is also a spread of ideas across the world. Some may see it as good, some may see it as bad, but it is undeniably happening. In architecture, there is a globalisation of styles. Once upon a time it would have been that the architecture in Britain would have been vastly different to the architecture in Egypt for example. Yet more recently, there has been an increasing convergence of styles. All over the world there are now towering skyscrapers in competition with each other. The introduction of the steel frame and other more modern building materials and techniques has brought about buildings that once wouldn't have existed. Due to improvements in communication, infrastructure and travel, all of these things have spread across the world. For example Masdar City, in Abu Dhabi, is being designed by Foster + Partners, who are based in London. Despite being subject to globalisation, Masdar City has not abandoned it's roots. It has been designed through reference to the past and as explained previously, above, many aspects of traditional Islamic architecture are still present. Islamic architecture has definitely taken a lean towards more modern approaches, as has a lot of the world. However, in my opinion at least, Islamic architecture seems to be holding onto it's roots far more than most. The image below shows 'The Souk Of AbuDhabi', which is another contemporary design of Islamic architecture. This beautiful image shows many references to more traditional approaches to Islamic architecture. It allows these modern builds to fit into the context of their surroundings, as opposed to conflicting with them. I find this to be something which the rest of world tends to struggle with. Perhaps we should begin to inform our design decisions through looking at how Islamic architecture works. Instead of concerning ourselves with how globalisation may effect that style, perhaps we should be accepting globalisation from it. I strongly believe, after researching through this task, that contemporary Islamic architecture presents plenty to learn from. In response to this research and the comparisons and analysis that it has produced, I have drawn my own interpretation of the content in this post, summarised into one drawing. It can be seen below. This drawing is my depiction of how globalisation has spread. There is a mix of culture, tradition and modern. I chose to show the Gherkin and the Shard through very traditional Islamic arches. I picked these buildings because of their iconic nature, they are symbols of modern day architecture. Furthermore, they are also both architectural icons of London, the city in which Foster + Partners (the company designing Masdar City) are based. Traditional Islamic architecture only tends to show views of the indoors. This is not always the case, but it is often a consistency. Here I have shown the buildings through the arches. My intention here is not that the arches be facing out into the world, but that they are still facing inwards towards the home. By doing this, my intention is to explain how other cultures and ideas are being accepted. It is as though these modern buildings have been accepted into a house of Islamic architectural design, and have been placed securely in amongst the courtyard. Edwards, N. (2012). "Granda, Spain: Guide To Visiting The Alhambra." Available: http://www.telegraph.co.uk/travel/destinations/europe/spain/9145335/Granada-Spain-guide-to-visiting-the-Alhambra.html. Last Accessed 09/11/2013.